Bookmark this smart storage idea ASAP. Whether you live in a five-floor manse or literal hole in the wall city apartment, there’s one thing we can all agree on: You can never have too much kitchen storage. Between the pans, the appliances, the dinnerware, the cool gadgets we love but will probably never use, and (of course!) the food, there’s a lot to keep organized. While we have our favorite tricks to follow for added storage, like faking a pantry or even something as small as adding wall hooks, we’re always looking for sneaky ways to add extra shelving wherever possible. One smart storage idea we’ve been seeing in several of our favorite homes lately? Kitchen islands with built-in shelves. Whether used to display stylish ceramic dinnerware or even as a cookbook hub, we’re all in for this particular organization trend. Read on to see how these chic spaces make maximum use of their islands. Designed by leanne ford for one of our favorite Restored by the Fords episodes, this sleek kitchen is making us want a matching set of whitewashed ceramic kitchenware ASAP—if only to display it all in our future kitchen island shelves. Keeping everything in uniform style and color makes this seem less like a necessary organizational tool and more like a intentional decor moment. There isn’t any regular cabinetry in this Oakland, California kitchen, meaning that any available space had to work double duty. Designer Bret Foken refinished the island with a fresh coat of paint to modernize it, but wanted to keep the handy piece as the centerpiece of the room. Not only does this island include top-to-bottom shelving, ideal for all entertaining essentials but it also appears to have cabinets built in, with doors that completely shut to keep more unsightly kitchen essentials hidden. Photographer Jonpaul and Netflix producer Anica Douglass were inspired by the Japanese practice of Wabi-sabi when designing their bright and airy LA home. The kitchen, which definitely leans minimalist but follows a looser interpretation of the aesthetic, blends contemporary style with more personal moments in keeping with the ethos of Wabi-sabi. One instance where this rings true is with the island shelving, in itself a rather stark fixture, but when filled with favorite cookbooks and colorful items, it lends a more lived-in feel to the space. 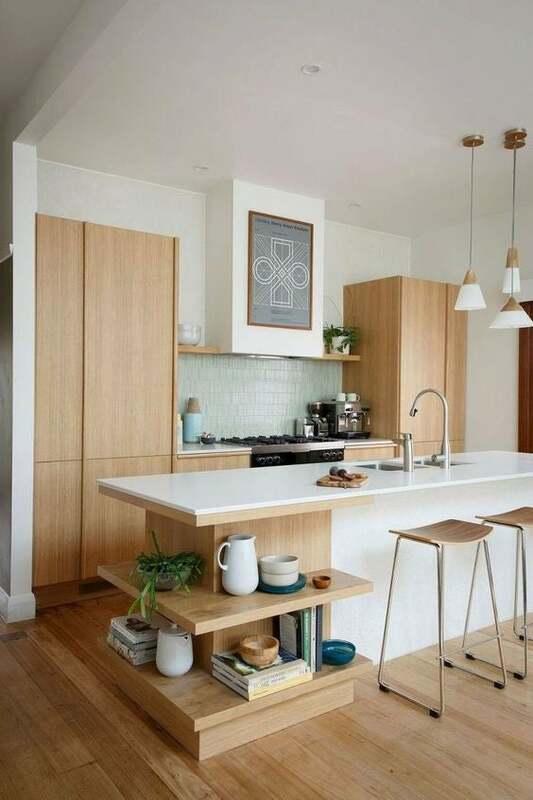 A more narrow kitchen island—or in this case, islands—doesn’t mean you can’t have shelving. It just means you have to be more selective about the items you put in. Designer Laura Burton prioritized adding storage in any way she could in this open-concept kitchen, and it definitely paid off. The smaller shelves make it look like every item has its own little custom compartment, perfectly created for that piece alone. If you’re going to go with a bold color with your cabinetry, have fun filling it with pieces that complement the shade. Vibrant yellows and soft pinks play off the deep blue cabinetry perfectly here. Leslie Bruce wanted the kitchen in her Laguna Beach home to be a calming space, featuring enough space to accommodate her young family without sacrificing style. As a result, her kitchen island shelving is filled with a mix of both decorative pieces and functional necessities; floral ceramics and pantry essentials alike have plenty of room in this organizational structure. While traditional shelving systems are all well and good, why not have a little fun with the shape of your island? The wraparound style of these shelves, in a mid-century modern space created by Freedom Kitchens, make for a more architectural piece and are a design statement in their own right. Add a mix of greenery, books, and ceramics, and you have the perfect little minimalist nook.